Long lengths are in! Black georgette semi stitched kurta embroidered with gold zari and vibrant thread work. Edging with a lovely shade of orange on the kurta and all around the dupatta. Comes with crepe salwar fabric. 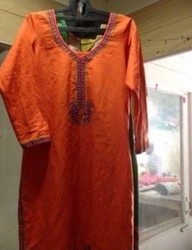 Beautiful cotton salwar kameej with embroidery and bead work.